Convert your desk to a healthy sit-stand workstation in minutes. 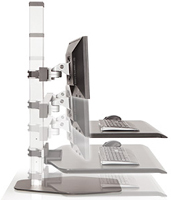 Winston Workstation triple freestanding sit-stand supports a three monitor setup and features push-button height adjustment. Triple monitor mount. 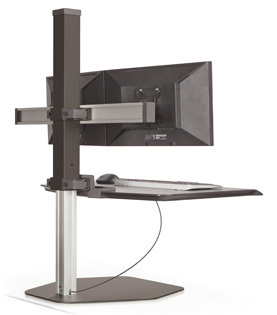 Sit-stand workstation with 17″ of height adjustment. Compact work surface. Freestanding mount sits on current desk. Question: I want to use this sit-stand with three 6 pound Dell screens (without stands). Would you recommend 0-24lbs or 15-26lbs option? Answer: You can get either option since your monitors are 18lbs combined weight. If you are anticipating getting heavy monitors in the future I would recommend the higher weight capacity 15-36lbs. If not, 0-24lbs would be suitable for your immediate and future monitors. Question: I have a 27", a 24" and a 22" monitor. 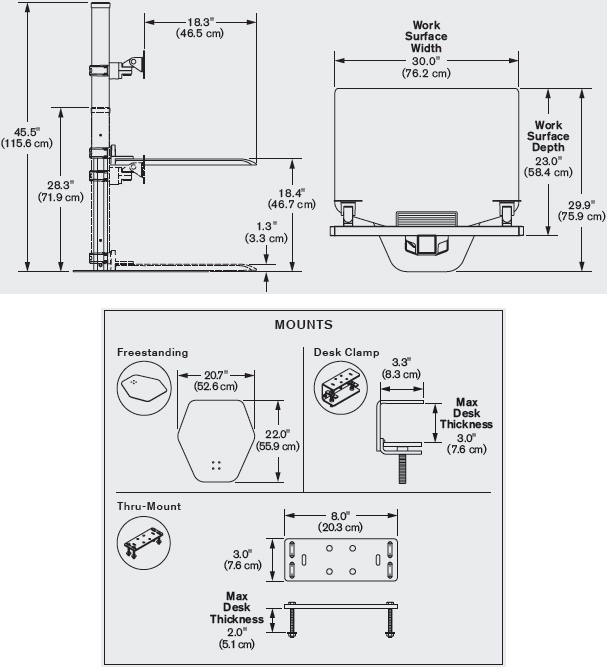 If I purchase the Winston Triple Monitor Sit-Stand Workstation, can I fit all three monitors side-by-side in landscape? And if not, what if I turned the 27" monitor portrait? Answer: This will fully depend on your specific monitors. In the most general terms, this will accommodate 3 monitors up to 24” wide (notice that this is the width rather than the diagonal as most monitors are usually measured – so it may very well accommodate the 27” monitor). The width is for the full width of the unit including bezel if any. So it will accommodate most displays up to 24” wide in landscape mode. Please let us know the exact model numbers of your monitors, so we can check for compatibility. Well-made, heavy duty stand we expect to get years of service from. This is our second one, the users love them. Being able to sit/stand is a great feature. There are other stands out there, we have a couple, they're okay, but IW products are a better grade of business product. They're not cheap, but worth it. Setup is straight forward, everything is provided and one person can accomplish it in about an hour. Monitors are a snug fit, so there's a bit 'wrestling' with them you'll have to do to get them lined up and angled like you want them. It takes a little finesse. One complaint. The plastic cable keepers that attach to the sides of the stand to assist cable routing, the 'detent pins' that hold them to the stand are too short, and they're prone to popping open when cabling monitors, or otherwise, once you work out the slack you need for when stand is raised, they kinda sorta work okay. Pricey, but its very well made using quality materials. Sturdy and went together pretty easy. The boss loves it, and that's most important of all! Purchased this desk after a recommendation from my employer's health and safety team. I needed one capable of holding three monitors and this model was found to be able to handle the load. The desk is a bit bulky but I am just glad to have the option to stand. It could use some work on making the monitors able to be moved up/down without having to disassemble everything. The mechanism to lift the sit-stand up and down could also be a little more fluid. 8 of 8 voted this review as helpful Was this review helpful to you?